Layla hologram effect Retro Pink | Light Your Nails! How’s your Monday? Mine is both good and bad! Weather outside is awful, I have a couple of broken nails and the other ones are badly peeling. The good part is we have another holiday on Wednesday so it’s one day off work! But let’s go on with today’s polish! 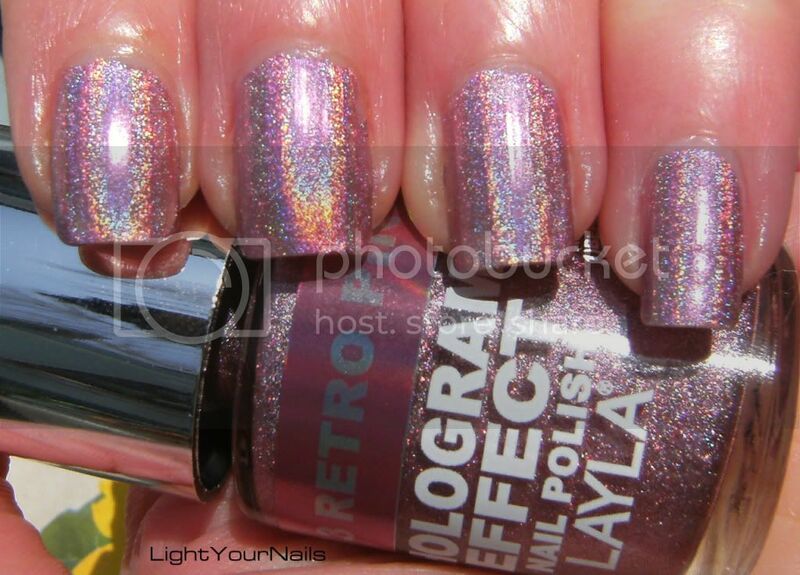 I picked another Layla holo for you, this one is Retro Pink and it is my second favourite after Flash Black. The holo effect in this one is once again amazing and I was staring at my nails all the time while wearing it! Come va il vostro lunedì? Il mio è da una parte bello e dall’altra bruttino. Ho un paio di unghie rotte e le altre si stanno sfaldando. Ma mercoledì è festa quindi va benissimo! Ma andiamo avanti con lo smalto di oggi. Ho scelto per voi un altro holo della Layla, questo è il Retro Pink ed è il mio secondo preferito dopo il Flash Black. L’effetto olografico di questo smalto è davvero sorprendente, non riuscivo a smettere di guardarmi le unghie! Have you surrendered to Layla holos yet? I know most of you bought at least one of them! E voi avete ceduto agli holo della Layla? So che la maggior parte di voi ne ha preso almeno uno!! I know Kellie! I guess holos are so great though that it's hard to let them go and swap them! It is! I bet this is the one that your friend wants! Gorgeous! I have 4 of the Layla holos now (now this one though) and they are all stunning! Thanks for the great swatches! We are even Carly! I also stopped at 4! So beautiful! I bought them all. Then got some backups I was so worried about never finding anything so pretty again. ROFL Karen! I know I'd never end a bottle so no backups for me! Ancora non te lo sei preso? Quello è un must eh. Non bisogna mai indossare questi smalti quando si guida, sono pericolosissimi!!! Gorgeous! I've bought a few of the Layla magnetics and really love them, and the more swatches of the holos I see the more I want to pick a few up! I have a feeling a couple of these will be making their way home with me. I think these are really worth it! I first bought two, then one more, and then again one!